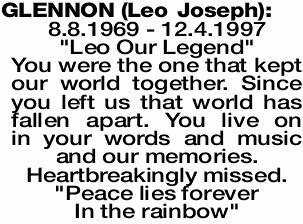 8.8.1969 - 12.4.1997 "Leo Our Legend" You were the one that kept our world together. Since you left us that world has fallen apart. You live on in your words and music and our memories. Heartbreakingly missed. "Peace lies forever In the rainbow"